The Jacksonville Jaguars announced that quarterback Blaine Gabbert has been placed on season-ending injured reserve with a right forearm injury he sustained in the first quarter of last Sunday's 43-37 overtime loss to the Houston Texans. In addition to the forearm injury, Gabbert has been bothered by a torn labrum in his left shoulder throughout this season, an ailment that was cited in the official release from the team's public relations department and which will require surgery to repair. Gabbert was selected with the No. 10 overall pick in the 2011 NFL draft to be the team's quarterback of the future. Coming out of a spread offense with no offseason to work with an NFL coaching staff, Gabbert strugged as a rookie, completing just 50.8 percent of 413 pass attempts for 2,214 yards with 12 touchdowns and 11 interceptions. Gabbert's passer rating was just 65.4 and he ranked dead last among qualifying quarterbacks in Football Outsiders' DYAR (Defense-adjusted Yards Above Replacement). This season, Gabbert's completion percentage had risen to 58.3 percent on 278 attempts for 1,662 yards with nine touchdowns and six interceptions. Gabbert still ranks towards the bottom in DYAR, however, ahead of only Matt Cassel of the Kansas City Chiefs. Gabbert has two seasons and $3,477,645 in fully guaranteed base salary remaining on his rookie contract, but the Jaguars only have one season remaining to determine whether or not to exercise their fifth-year option on the contract, a decision that needs to be made between the final regular-season game of 2013 and May 3, 2014. 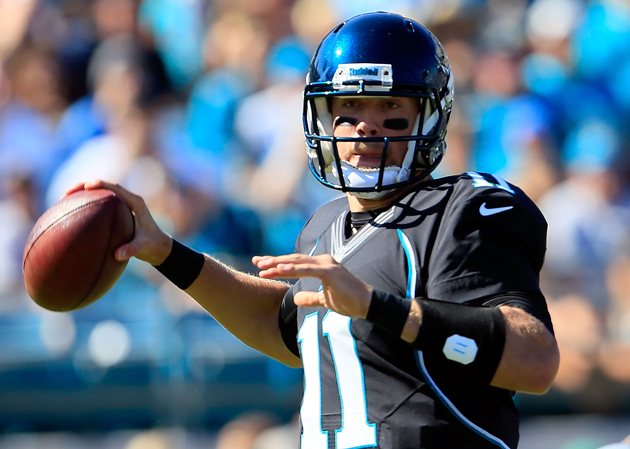 With Gabbert placed on the shelf, Chad Henne ascends to the top spot on the depth chart. Henne was signed to a two-year, $6.75 million contract to back up and push Gabbert, a deal that included $4.075 million guaranteed money. In four appearances this season, Henne has completed 37 of 71 pass attempts for 569 yards with five touchdowns and one interception. Most of Henne's production came in relief of Gabbert last Sunday, with the former Miami Dolphins quarterback passing for 354 yards and four touchdown in the overtime loss. The Jaguars had been carrying only two quarterbacks on the 53-man roster, but have signed Jordan Palmer to replace Gabbert on the active roster. The club also has former Alabama and Atlanta Falcons backup John Parker Wilson on the practice squad. In addition to placing Gabbert on injured reserve, the Jaguars placed wide receiver Laurent Robinson on injured reserve with a concussion, his third of the regular season. To bolster a passing offense that ranked 32nd in the NFL in 2011, the Jaguars signed Robinson to a five-year, $32.5 million contract that included $13.6 million in guaranteed money, including a fully guaranteed $2.6 million base salary for the 2013 season. In seven games this season, Robinson caught 24 passes for 252 yards and did not find the end zone once after being among the league leaders with 11 during his 2011 season with the Dallas Cowboys.